R&R Hi-Way Bait Stand and Marina is a full service tackle and bait shop, marina, and private fishing guide service. Established in 1947, we’re Port Isabel’s oldest bait stand and charter service. 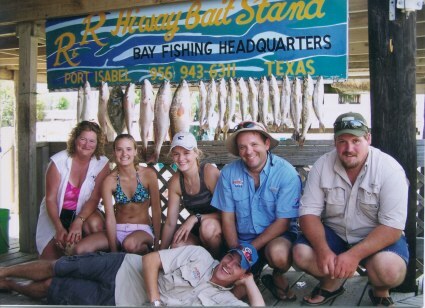 We’ve been a part of Port Isabel’s fishing tradition for over 60 years and when it comes to fishing, experience counts! The fishing tradition is still going strong at R&R Hi-Way Bait Stand. Our Port Isabel TX bait and tackle shop specialize in light tackle, shallow water, sport fishing in the flats of the Lower Laguna Madre at the Southernmost tip of Texas. Our TX bait shop use both live and artificial baits targeting trout, red fish, flounder, drum, and snook. Using a variety of fishing techniques, we work hard to make your private fishing trip a pleasurable one. From the experienced fisherman to the novice, our captains can accommodate your fishing needs. When you charter a fishing boat from R&R Hi-Way Bait Stand you can be confident you’ll fish with a professional guide who is a licensed captain and has years of experience fishing the waters of the Lower Laguna Madre. COPYRIGHT 2018 - R and R Hi-Way Bait Stand and Marina. ALL RIGHT RESERVED.